Ho Ho Ho! Santa is visiting the lunchboxes today. Santa is made from Naan bread, provolone cheese, fruit roll-ups, and raisins for eyes. On the side is a homemade pumpkin muffin and red and green grapes. The girls had 5 pm dental appointments and I had a meeting after that last night, so I asked Addie to make the pumpkin muffins while I was gone. It's so nice when your child is old enough to start helping in the kitchen! I added the snowflakes this morning. I sampled one for breakfast and it was delicious. Speaking of Addie, it seems I have more pictures of Caroline than her on the blog. She has reached the eye-rolling stage when I pull out the camera, so I thought I'd sneak in another blast from the past. 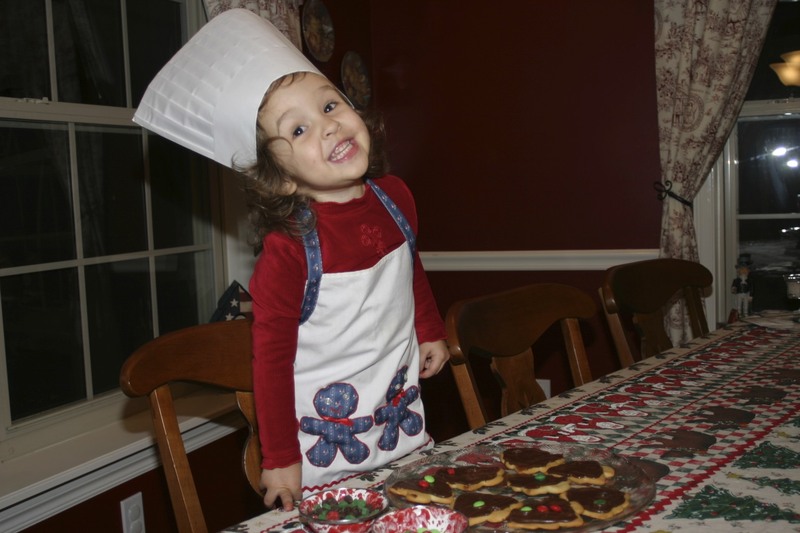 Here's my little cutie several Christmases ago when she actually wanted her picture taken. Have a great day! I'm thinking about making grownup lunchboxes for Mike while the kids are out for Christmas break.